We just returned from a couple weeks in Spain, where we had our first visit to the Guggenheim in Bilbao. It was so exciting I feel I must share it. The museum is spectacular, but what I really want to tell you all about is the interpretive space for Richard Serra’s monumental sculpture installation. Serra’s work is breathtaking in the Guggenheim gallery: huge space with a balcony at one end to look over the whole thing from the second floor. Unfortunately there aren’t a lot of pictures on the Guggenheim site, so you’ll have to take my word for it. In about the middle of the gallery is a separate room designed to help people interpret the Serra work. In the room is a small scale model of the larger gallery that really gives you the sense of circulation that Serra talks about in the audio tour segment about the installation. There is also a timeline of Serra’s work, diagrams of the various forms he refers to in his work and in the aforementioned audio tour, and a small viewing room where Charlie Rose’s interview with Serra is on continuous loop. The interpretive strategy here is so effective because so many different types of interpretation are included. The audio tour is free, and most visitors must listen to that portion judging by the amount of people in the gallery with an audio wand glued to their ears. The audio tour that features Serra talking about his work is just great, he’s so good at describing the ideas behind his work and talking about its meaning. There are things for people to read, to look at and to watch. The scale model is worth a good ponder, while the technical form diagrams are a quick “Oh, I get it!” especially if you’ve already listened to the audio tour. 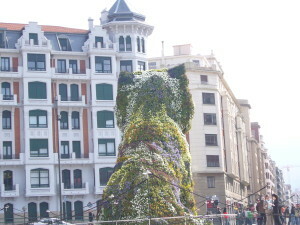 The Guggenheim doesn’t allow pictures inside the building, but I did snap this picture of Jeff Koons’ puppy looking over the city of Bilbao. The Salvador Dali Museum in Figueres, Spain was a whole different scene. The place was mobbed, everyone touching everything, people snapping pictures right and left, all with their flashes on, even though the rules clearly stated that no camera flashes were allowed.￼All of the guards were completely indifferent, and Dali would have loved it all.